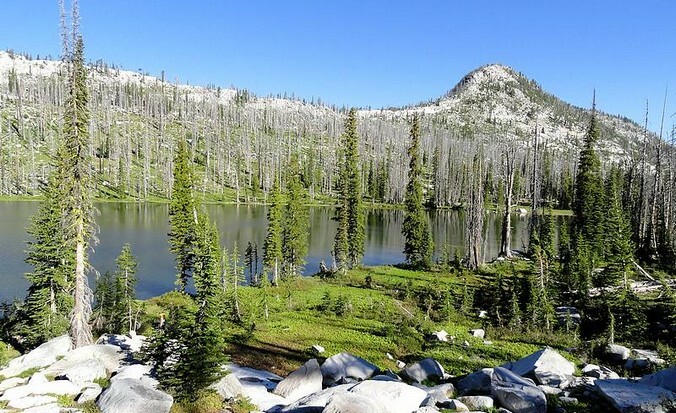 Pearl Lake is a pretty subalpine lake located in the Lick Creek Mountains, just north of McCall Idaho. It is reached via a scenic and easy hiking trail, making it a great destination for families with young kids. Marge Lake is located just over the ridge from Pearl Lake, can be reached via an off-trail bushwhack. The hike starts at the Crestline Trailhead, and wanders through a recovering burn area en route to the lake. There are plenty of windflowers, granite outcroppings, and open views along the way. After a 3+ hour drive from Boise, and a quick stop at My Fathers Place, the boys and I hit the got to the trailhead at just after 6pm. A passenger car might be able to make it, but high clearance is advised. There were no other cars at the trailhead when we arrived, so we were alone other than a deer that my oldest son spotted in the meadow across the creek. One other rig showed up while we were making PB&J’s. They were headed to Pearl, so we figured to have solitude at Marge. Once on the trail, I was having a little trouble keeping up with the boys. Fortunately the grade of the trail was pretty flat, so it made the weight of the 50lb “expedition pack” a little easier to bear. We had a good time checking out the wildflowers and view along the way. Soon enough, we made it the Pearl Lake, after about 2 miles and 250’ elevation gain. It was quite scenic and there were several good campsites. But the boys spirits were high, and they seemed to have plenty of energy, so we decided to continue as planned to Marge Lake, which would be another mile and 400’ elevation gain and bushwhacking up an over the ridge. We headed west from Pearl Lake, going cross-country through a occasional downed trees. Soon we got to an open meadow. It looked a little marshy, but we headed out into the grass to avoid all the downed trees in the forest. Well it turned out to be a little soggy, and took us forever to weave our way through the various streams and puddles. But least we had fun spotting frogs along the way. Once past the marsh, it was back to a steady diet of fallen trees to hop over. But the boys spirits stayed high, and we made steady progress. There were a few places were granite slabs made for fun “sidewalks” up the hillside. Eventually we got to the saddle on the ridge overlooking Marge Lake. The lake was a welcome sight, but we could also see even more logs to cross. This wouldn’t have been too bad for a group of adults, but my two sons (ages 6 & 8) really had to persevere in order to reach the lake by 9pm. Marge Lake was pretty, and doesn’t appear to get much traffic. We set up camp, and turned in for the night, with a little star gazing before dozing off. The next morning we woke early and treated ourselves to some muffins for breakfast. The boys wanted to do some exploring, so we did a fun creek crossing on a big log, and headed for some snowfields on the far side of the lake. The boys had fun playing, and I had fun watching. At that point we were almost halfway around the lake, so we decided to keep going. There was a neat little waterfall spilling off some small cliffs east of the lake, and then I taught the boys how to boulder-hop for a while before circling back to the campsite. The boys ate granola bars, I packed up camp, and then we were on our way again. I continued to be amazed by how good the boys moods were as we clamored our way up through the brush. I guess the adventure was keeping them entertained. 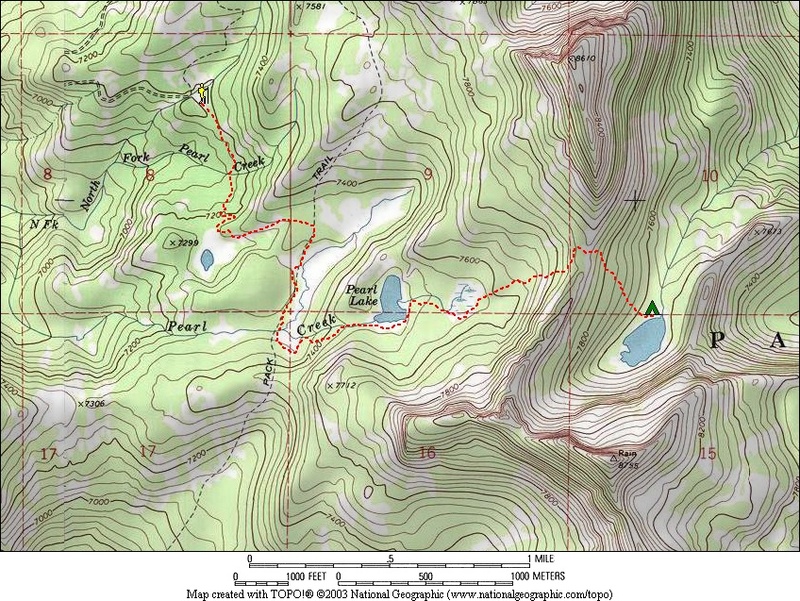 So we retraced our steps from the prior evening, up and over the ridge and back down to Pearl Lake. After an extended lunch break at Pearl Lake for pizzadillas, we made good time back down the trail to the car, passing several groups of day hikers on their way in. Map of our route, 6 miles round trip 1500' elevation. Crossing the bridge near the trailhead. Checking out a hollowed out snag. Beautiful green meadows in the burn area. Crossing Pearl Creek, just before the trail forks. View from the southwest corner of Pearl Lake. Climbing some fun granite slabs en route to Marge Lake. Alpenglow on Rain Peak, above Marge Lake. Our campsite at Marge Lake. Warming up in the sun the next morning. Crossing a log across the Marge Lake outlet stream. Stopping for a group shot. Playing on a big snowfield near the lake. Climbing back up and over the saddle from Marge to Pearl. Taking a break on a big granite boulder.